Not interrupting your enemy when they’re screwing up makes a lot of sense… unless of course you happen to be your own worst enemy. How can any business owner not even begin to understand the power of social media? How many Egyptian-like social media enabled rebellions must business people witness before they understand the power of the Internet? The article garnered 554 tweets and over 7,000 Facebook (FB) likes. 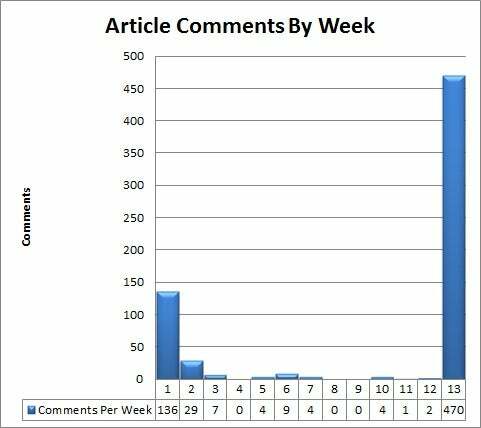 A quick survey of City Paper articles shows that few, if any, other articles by Mr. McKenna rate more than 5 comments, tweets or FB likes. So what is the recipe to the Washington City Paper’s traffic increase? Is there a repeatable model or secret sauce that web entrepreneurs can bottle to drive traffic to their sites? Unfortunately not, because in this case, the increase in traffic was not driven by direct action by the paper. Because Snyder disliked what was written, he sued the paper in a law suit filed February 2nd, drawing thousands to the read the article and igniting a social network firestorm in response. If Dan Snyder didn’t want anyone to read the article, then he should have done what 99% of the rest of us Washingtonians did… ignore it. Attention begets more attention. The power of the internet and social media teamed with the ancient proverb, “the enemy of my enemy is my friend,” aligned to bring thousands of anti-Snyder fans to read the article that Snyder was trying to quash. Activity on the Paper’s Facebook Group has increased and is overwhelmingly supportive, as is the Twittosphere. Sentiment towards Snyder is unanimously negative as measured by tools like Tweet Feel which at my last count showed a 100% anti-Snyder rating, well below Hosni Mubarak who came in at 67% negative. Social media is aligned against him as are many traditional media outlets. So, how should a media savvy, wealthy business mogul deal with this issue? Well another local business mogul turned NHL and NBA team owner, Ted Leonsis, does it three ways: 1) he treats people pretty well, 2) he understands and works both traditional media and social media, and 3) he’s transparent and doesn’t hide from his mistakes. Another example – owner of the Dallas Mavericks, Mark Cuban. Cuban totally gets the power of todays tools – he tweets with fans, blogs his thoughts and engages. In other words, Leonsis and Cuban respect the power of their audiences and do what they can to be in alignment with fans. The lesson that, hopefully, Hosni Mubarak and Dan Snyder are learning is that you have to acknowledge and engage with your audience, and social media not only allows for that, but invites you into the conversation – which is happening with or without you. You can’t just turn it off as Mubarak tried when he shut down the Internet in Egypt last week. And you can’t buy or sue every media outlet, attempting complete censorship. You can’t hide the truth. But you can apologize for mistakes. You can ask for input. And you can and should engage in social media to shape the conversation – not control it. The world has become too transparent to pretend anything. Link here to read about the Washington City Paper’s Legal Defense Fund and to see links to letters to Atalaya Capital Management (hedge fund that owns the city paper), Atalaya Capital’s response, and Snyder’s complaint filed in hostile NY Giant Territory. Partial image attribution to: clker.com. UPDATE: Read our update on the article posted on February 11th.